My sampler is designed for taking discrete samples at any depth for qualitative and quantitative study, and at the bottom of lakes and rivers where sediments can be collected for sampling interstitial habitats for qualitative study. The unit, with a one litre capacity, has a 60 mm opening at the bottom linked to an air valve at the top. It is water and air tight when these openings are closed. For sampling at moderate depths, the unit is lowered by means of one or more 150 cm sections of ½ in PVC pipe. They assemble to each other and attach to the sampler by means of threaded ends. The number of sections is determined by the depth at which the sample is to be taken. For sampling at depths greater than practical with the pipe sections, the top of the unit is fitted with a weighted section and lowered on a line. 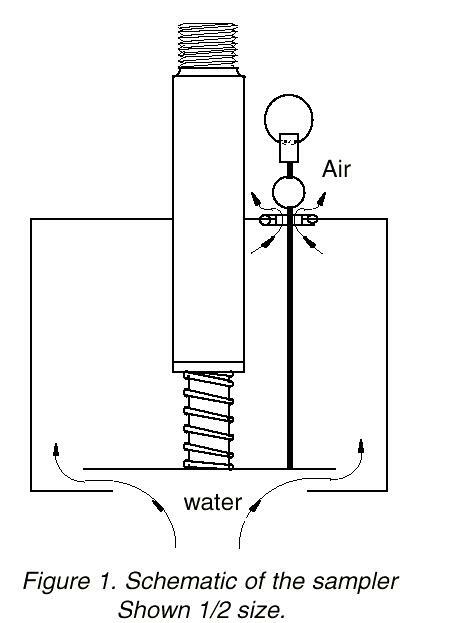 The plate which closes the intake opening at the bottom of the unit is normally held closed by a compression spring, and is linked by a shaft to a ball which seats in a rubber grommet to form the airtight valve. The ball can be adjusted vertically to provide the proper seal when the unit is closed. The upper end of the linking shaft ends in a fitting with a ring for attaching the control line with a snap fitting. When the sampler is lowered to a selected depth or to the bottom and held in place by the extension sections or the weight, tension on the control line opens the intake and the air valve simultaneously. Contained air escapes, allowing water to flow in. Figure 1 illustrates the design principle of the sampler. 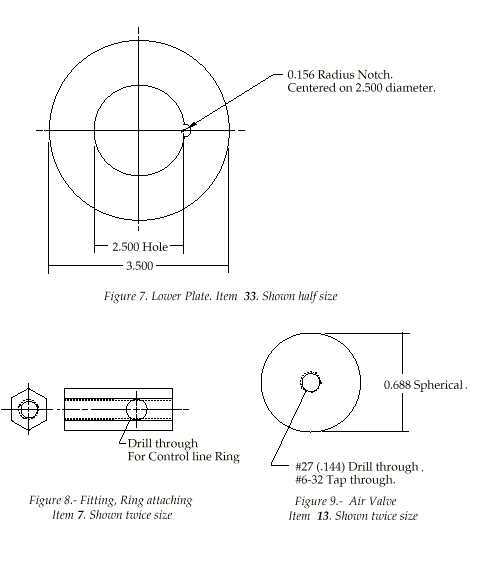 Figure 2 shows the unit. The top plate is secured by wing nuts. When these are removed, the interior parts can be lifted out giving access to all parts so the unit can be cleaned. The bottom plate is secured in the same manner. The design makes maximum use of low cost, commercially available parts which require a minimum of machining. These include small plumbing PVC fittings which do not require modification; plumbing PVC pipe, which only requires cutting to length; one larger PVC part which is used for the body and only requires drilling and tapping; brass sheet which requires sawing and drilling; round brass bar and telescoping brass tubing which only require cutting to length; a compression spring, automotive gasket material; threaded brass rod; fasteners; one grommet; two O-rings; one 17 mm diameter bead (such as plastic costume jewelry); one key ring; and four 16 ounce lead sinkers. The sampler is shown full size and in partial section in Figure 1. 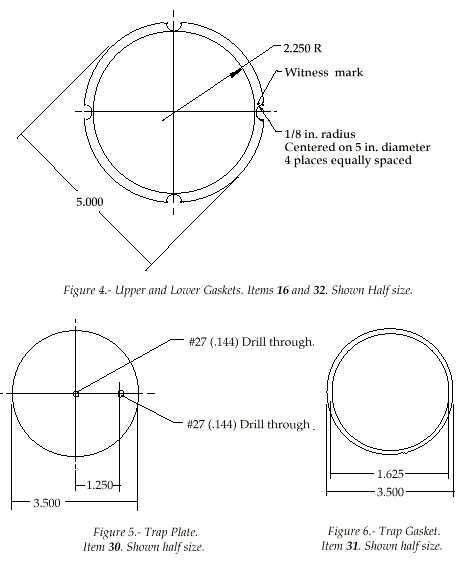 The parts are identified by reference numbers and described in the following notes. The PVC pipe and the fittings are available from plumbing supply houses and Home Depot in the U.S. 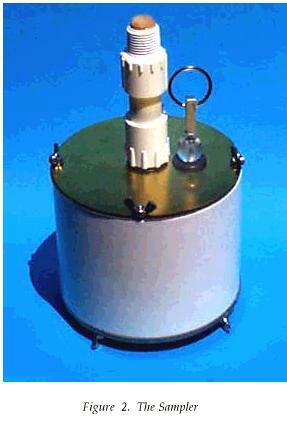 They are defined by their interior diameters and types. The outside diameters and lengths of PVC fittings vary somewhat depending on the manufacturer, but this does not present a problem in the the design of this unit. The metal parts are available from Small Parts, Inc., 13980 N. W. 58th Court, P.O.Box 4650, Miami Lakes, Florida 33014-0650, USA. The firm has a website: www.smallparts.com and can be reached by e-mail at smlparts@smallparts.com. 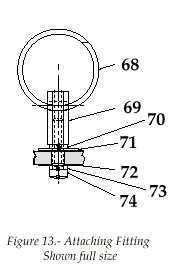 SP part numbers are included in the following descriptions. 2 SEAL – ½ inch diameter. Can be of any material. It is epoxied into place as shown in figure 2 before part 3 is installed. The length of this assembly is not critical. It must fit freely within the assembled parts 1, 4 and 5 and should be shorter than the interior of the assembled PVC parts. 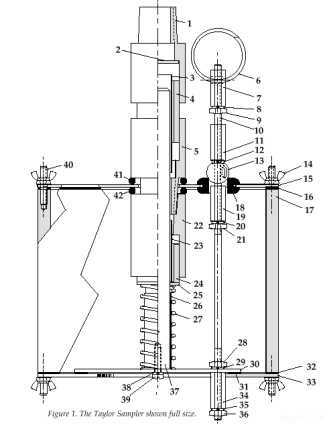 The function of the liner is to restrain lateral movement of shaft 36 when the sampler is opened by the off-center control rod 10 so that parallelism between the trap 30 and the opening in the lower plate 32 is maintained. The tubes should be cut so that they will be flush with pipe 4 when it is cemented in place. 4 PIPE – ½ inch PVC. Is installed in part 1 with PVC cement. The length of this part is not critical. The way it assembles in male adaptors 1 and 5 will determine the length of the upper liner assembly 3. 5 LOWER MALE ADAPTOR – ½ inch PVC, male thread. This part is installed and cemented on pipe 4 with the upper liner assembly 3 in place. 6 RING, CONTROL LINE ATTACHING – This can be a key ring. It should be large enough so that a finger can be inserted to open the unit. The 150 cm long Sampler Rod shown in Figure 10 threads onto the male fitting 1 shown in figure 1 for collecting bottom samples in shallow water at the shore line. One or more 150 cm long Rod extensions shown in figure 11 can be installed between the rod and the sampler for working in greater depths. The Weighted Section shown in Figure 12 is loaded with five 16 ounce lead fishing weights. The length of the 1½ inch pipe 61 is determined by the type of weights. During assembly, the fastener 74 is epoxied into the #27 (.144) clearance drill hole in the cap 60 to make the opening water tight.Seal 67 is epoxied in fitting 66 before pipe 65 is installed. 67 SEAL – ½ inch diameter. Can be of any material. It is epoxied into place in 66, as shown in figure 12, before 65 is installed. 68 RING, LOWERING LINE ATTACHING – This can be a key ring.